ACT for Congo was formed to “do it” differently: use “development aid” to help local organizations with vision and experience develop sustainable change. Too often the programs we knew well did not make the communities stronger; in fact, they often became more dependent on external aid. How can resources create a transfer of power and ownership for lasting development? What fosters development – with lasting results that nurture peoples’ talents and respect their dignity and independence? Foreign organizational interventions meet an emergent or short-term need. Certainly, especially in areas of conflict, this kind of aid has a useful purpose. If the goal is lasting development for the people in DR Congo, foreign organizations often wind up in a double bind: their presence creates dependence for their beneficiaries, but they would create another crisis if they discontinued. They would leave a vacuum of ownership and no local organizations with the latitude to carry on. Nobody is empowered when foreign organizations control access to their basic needs. Foreign aid is important in addressing a crisis. But by itself it is the wrong tool to foster independence. ACT for Congo focuses on the transition from crisis to independence. We partner with local organizations who have both vision and experience and help them build on their existing capacity. Our goal is to be an ally, to accompany our partners as they network so they can obtain access to resources on their own terms. We help them with communication until their names are internationally recognized. We consult with them about program development, self-evaluation, building data programs, media ability, international standards for reporting, and we provide technical support so that they are recognized for their achievements both locally and internationally. We are different because of our personal history and relationships. Our primary responsibility is to our partners’ strength and capacity. When our work is finished, our partners are the ones who remain, own, control, and lead. Their communities, the local government, and external organizations will be able to trust and depend on them rather than a large organization from outside Congo. Non-Governmental Organizations focus on their own sustainability. ACT for Congo focuses on helping their partners become sustainable. About five years ago, we were approached by a group of Congolese colleagues, some we’d worked with for a decade. They told us that they were looking at the 2011 Human Development Index (HDI) numbers, and DR Congo was second to lowest on the list. That was the moment our mission statement formed. We realized that this group of professionals, working in their own community, could affect change without creating dependence. They had the people’s trust, and they understood the local problems from an insider’s perspective. But they didn’t have resources. They wanted to work with the most vulnerable people, so they created an integrated program that empowers young, single mothers through vocational training, counseling, life skills and continuing education to participate in the local economy and become respected leaders in their community. The beneficiaries become peer educators, who foster health by teaching people how to avoid preventable diseases, empower women when they learn and appropriate new information, and they strengthen community by raising issues and facilitating discussions about change. . They work with others in their community to change the conditions that kept the HDI in DR Congo so appallingly low. To date, we are working with three Congolese non-profits in DR Congo: our founding partner, Humanitarian Organization for Lasting Development – Democratic Republic of the Congo (HOLD-DRC), Congo Nouveau, and Pole Institute. ACT for Congo identifies and supports local, innovative, integrated programs that create positive change – with the goal that these organizations remain independent and fulfill roles that are so often given to foreign NGOs. We provide fiscal credibility, technical support, and general consulting while they build their capacity and international reputations. We provide our donors with assurance that our partners operate and report at an international standard. Mostly, we walk with our partners as they do the difficult work of creating lasting development. The support we provide includes scholarships for training and opportunities to present their work at international conferences. Early on, we developed website presence to help HOLD-DRC communicate with large organizations – although they have a mature website of their own now. Currently, we are helping HOLD develop data management and analysis tools so they can control their own data-driven programs for reporting and self-evaluation. We work with and connect them with university faculty for feedback. Perhaps most importantly, we help them make useful connections with other non-profits locally and internationally. In six years HOLD-DRC has developed an integrated training approach that brings traumatized victims of abuse of various forms linked to violence, conflict, and power in eastern DRC through a learning process that teaches specific skills that enable beneficiaries (called clients) to earn money enough to feed themselves and their children in a day—and gives them hope that their life can change. That makes dreaming possible. It is fueled by the support women get from each other and from HOLD staff, and eventually, from their families and community who see the changes as clients learn, practice and become confident. This program follows the DRC national curriculum for Culinary Arts, Tailoring and Esthetician, and has developed the first curriculum for Professional Cleaning in the country. 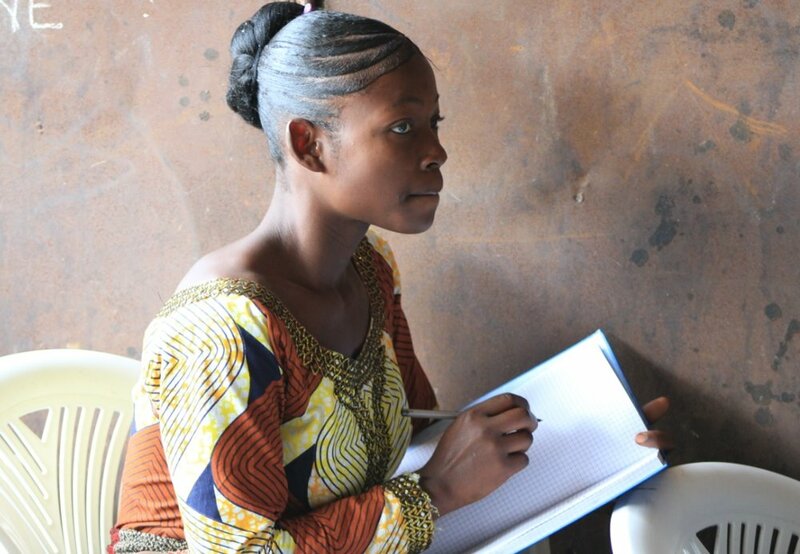 Each woman who passes a juried exam administered by the DRC state earns a state-issued certificate. HOLD works with faith and community leaders, political leaders, parents, schools, medical centers to identify beneficiaries. Because of the success of their training program HOLD is called weekly to teach, facilitate discussions on subjects relating to health, sexuality, rights protected in the Congolese 2006 constitution, peacebuilding in families and diverse community, and the environment. HOLD has trained peer educators-volunteer alumni who have been trained on a variety of topics and present in schools, clinics, marketplaces and door to door. They do radio broadcasts with Pole’s radio station. They use drama, dance and music as they present information in story form written by the Cultural Club at HOLD. HOLD also has a partnership agreement with Pole Institute, who is doing research on women with microbusinesses. HOLD works with a variety of local schools and medical clinics to present information that ranges from rights to reproductive health to breastfeeding. Their careful accounting and integrity, reporting and media team make them a valued partner in Goma, Seattle, Chicago and Stockholm. Or anywhere. HOLD decided that to address the most vulnerable people in society they should focus on teen mothers and abandoned women with children and provide the type of training and life skills that enable women to successfully provide for themselves and their children. They have created a nine-month accredited vocational training program and have been singled out by the North Kivu Department of Social Services as a Center of Excellence. HOLD follows the DRC national curriculum for Culinary Arts, Tailoring and Esthetician, and has developed the first curriculum for Professional Cleaning in the country. Each woman who passes a juried exam administered by the DRC state earns a state-issued certificate,"
This program became the model for vocational training used by Tenke Foundation in Katanga province, and has been shared with programs in northwestern Congo as well. HOLD knows the cultural issues and taboos that make addressing sexual violence and stigmatization, rights, human reproductive health and hygiene practices so difficult. The Cultural Club is both trauma therapy for those who dance and act and a learning experience as they develop material—music, dance and drama about relevant issues. When they perform for schools, clinics or marketplaces they contribute to the information available to the public, and they gain self-confidence. The dramas are meant to provoke discussion and conversations within the community. Peer educators and the Cultural Club began a campaign to raise awareness about the policy of automatic expulsion for girls who become pregnant four years ago. This led to forty-some school principals in Goma who’ve committed to a new Code of Conduct which assures the girls the right to continue their education. HOLD is respected in the community for its voice and its leadership. Teaching and modeling positive masculinity through peer educators, the Cultural Club and discussions among staff, volunteers and community leaders. Women must be able to read and write to be successful in business. For years it was offered at HOLD after hours, but women have too many other responsibilities to stay late, so it was added in the new vocational track in 2017. Literacy is part of the curriculum for Professional Cleaning and they begin in the morning with Literacy. This class conforms to national standards and women who take and pass exams get certificates of reading level from the state. Some of those who’ve completed the first steps in literacy have returned to the national adult education system to continue their progress. HOLD’s counselors follow each woman from the initial listening session through their entire training program and remain in contact with many women for as long as they have telephones. Many return to give updates and see their counselors; they call HOLD their “family”. Counselors provide group therapy, family mediation and home visits, referral to medical and mental specialists, aural acupuncture and therapy with small animal husbandry and vegetable gardens. Counselors and staff are highly committed to the success of each woman who comes through the program and keep records to show progress. HOLD also connects women with legal assistance when needed. Each beneficiary becomes part of a Human Development Club, and she may belong for as long as she wants to. The monthly meetings of the Association of Human Development Clubs are a resource to all graduates, a place to learn and develop relationships as well as a mechanism for savings and rotating credit. HOLD provides small business training to each cohort, and ongoing coaching, assessment and encouragement. This process helps women learn the basics and get experience from which to grow their business. Some women have already made small loans to others, using interest, to help them start their own businesses! The Children’s Space was created to care for children whose moms are learning at HOLD. It provides an early-childhood learning experience in a safe environment. Children are accepted only if their mom has no other safe place to leave them. They learn the basics of kindergarten—how to play, how to respect each other, the basics of learning to read, a bit about the environment, and how they can help their mothers. They learn to brush their teeth and why it’s important to wash your hands before eating. They learn a few phrases in French and mostly, learn that they’re welcome. For some children, it’s the first time they feel they belong. For some mothers, it’s the thing they miss most when they graduate: this opportunity for their children. For some, the nutrition given to the children (and breast-feeding moms) is the best meal of the day. There are 55 children between 0 and 6 years old, 22 breast-feeding babies and 33 toddlers on up. It’s crowded and teeming with life. Two teachers have their hands full! When one of HOLD’s clients, a young mother, learned about the relationships between human activity, health and the air she breathes, she started an Environment Club –and started cleaning her neighborhood street. She engaged others in her cohort, and women in the neighborhood became aware of the need to work together to educate everyone else. But she realized that it was important to start with children, so they began a summer camp called “Friends protecting Nature”. It has become the Environment Club at HOLD, and children aged 7-18 attend on school holidays to make items from recycled cloth, glass, plastic bottles and bottlecaps. They make art and jewelry and sell it at the Kitenge Fashion Shop (at HOLD). Kitenge Fashion, led by graduates of the Tailoring class, creates new styles and sells them to the public. HOLD provides the space for them to work and display, easy for customers to order and pick up! Look at their work on HOLD’s Facebook page: facebook/hold.goma or on their website: www.holddrc.org ! HOLD’s media department is developing short videos, music and keeping up with social media to inform the world of the people, the work and the impact of HOLD-DRC in Goma. Here is a recent video of a HOLD’s participation in a Goma-wide Volcano Fashion Show. Kitenge Fashion was voted Best in Show. Pole Institute was developed by Congolese researchers and community leaders over 20 years ago with the purpose on providing accurate information and analysis about Eastern Congo. With conflict in the region and many different groups of people living there, Pole is an indispensable resource for valid information about the state of affairs. Pole conducts research and provides information to foreign researchers and NGOs, but they also serve as a resource for local people. They maintain a library and host radio shows that provide news and analysis to inform local Congolese communities. Pole's research brings together varied voices of all ages and ethnic groups in Eastern Congo. Students come to Pole from schools all over the region to make use of their reading room. Their work persists in spite of conflict and war. In fact, they are leading voices in how conflict gets transformed. HOLD-DRC began working with Pole to help women promote peacebuilding and become more successful in their businesses. Pole also hosts a radio show with HOLD that addresses people's everyday struggles and how they find solutions. We believe that Congolese researchers should be the recognized experts and that the research they conduct should be valued. ACT for Congo believes that research done by Congolese should be available to their leadership and to citizens of the DRC in order to inform decisions at all levels. Congolese expertise is often overlooked because of the languages it is told/written in. Pole researchers are trained in international standards, speak both international languages and are fluent in local languages and cultures. They work closely with our partners, and ACT for Congo will continue to collaborate wherever possible. This Congolese registered nonprofit organization has leadership from all parts of the huge Democratic Republic of Congo, and its focus is on leadership principles, nonviolent training and civic education which is equally applicable to every part of the country and necessary for effective governance of this huge space in central Africa. Such an effort has not been possible in the past because of the difficulties in communication and lack of infrastructure. Today with cell towers in almost every part of the country and the telecommunications industry, this type of training is accessible and possible, and it is possible to network. These young Congolese professionals are passionate about connecting youth organizations across the whole DRC and providing civic education, community mobilization and nonviolence training to people concerned about the future of their country, from governance to local initiatives and entrepreneurs. Their training is effective and professional. ACT for Congo will continue to facilitate their work whenever possible.